Out of all the superheroes, both Marvel and DC, Deadpool is my favourite. The reason why? Compared to the others, which tend to follow quite specific structures, he’s just so different and off the wall. Watching the first ‘Deadpool’ in 2016 was refreshing, and added an edge to Marvel films that we hadn’t seen before. 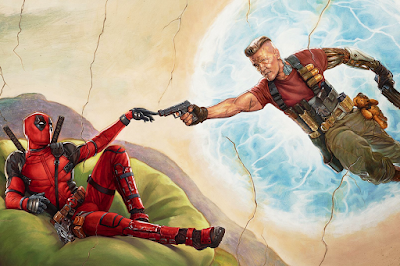 Now comes ‘Deadpool 2’, where you can expect an even greater level of both bizarre and crude antics. Wade Wilson (Ryan Reynolds) is still fighting crime full-time but, after the death of long-term girlfriend Vanessa (Morena Baccarin), his life starts to fall apart once again. With some persuasion from the remaining X Men members, Deadpool agrees to join as a trainee, and on their first mission together he encounters Russell aka Firefist (Julian Dennison), a 14 year old fellow mutant with the great combination of flaming fists and anger issues. Things go wrong very quickly for both of them, and the two find themselves without their powers and trying to escape from Cable (Josh Brolin), a time-bending mutant from the future with a goal of destroying Firefist for reasons unbeknown to everyone else. It’s hard to review ‘Deadpool 2’ without comparing it to the first one, as it’s borrowed a very similar structure and layout and so feels formulaic at points. It’s still pretty hilarious though – although a couple of jokes fall flat they’re mostly really funny, and are typically executed by building on jokes from the previous film in new ways. Remember the regrowing hand? That’s now been taken to a whole new level. There are some real standout scenes when it comes to humour, and a bunch of side-splitting quips aimed mostly at DC and various other Marvel superheroes (my favourite being a reference to the “Martha” scene in “Batman vs. Superman: Dawn of Justice”). Sometimes the humour felt overshadowed by the emotion in the film which, although played an important part, seemed slightly too sombre at certain points. Thankfully the humour was effective enough that this wasn’t too much of an issue. As always, the chemistry between the characters is excellently done, and the general acting can’t be faulted, with Reynolds and Brolin particularly standing out for their performances. Domino (Zazie Beetz), a character who appears later on in the film, was also brilliant, and someone I’d definitely like to see more of both as actress and superhero. There’s another antagonist besides Cable who appears during the second half of the film, but I felt didn’t live up to his potential – unlike other characters there was no backstory and little motive surrounding him, and I felt that the writers put a little too much expectation on the viewer to know this about him already from the comics. As someone who hasn’t read those particular comics, I found it hard to relate him and wasn’t overly impressed by the scenes that featured him. There were several aspects that really made the film a great sequel; one being the CGI, which was utterly grotesque at points but really well choreographed, particularly within the fight scenes. The other was the little details that were included – from pop culture references to breaking the fourth wall, every line felt crafted and didn’t let the film take itself too seriously. The ending definitely hinted at a sequel, but Marvel needs to try something new now to ensure its success – I’m hoping for a multi-superhero movie as opposed to ‘Deadpool 3’ as brilliant chemistry is something that the franchise could really capitalise on further, considering how well it’s been delivered in both 1 and 2. Whether or not this happens you can’t deny that ‘Deadpool 2’ is another great superhero film – although not quite as good as ‘Deadpool’, you’ll certainly be missing out if you don’t watch it.